This column appears in the July 27 issue of ESPN The Magazine. Okay, so I've been thinking about retirements lately. 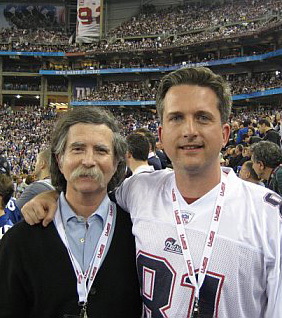 Courtesy Bill Simmons The Sports Dad is a familiar figure for avid readers of the Sports Guy. My father is retiring after 33 years as a school administrator in Easton, Mass., the last 16 as district superintendent. (And if you don't know why he's excited about 33 being his walk-off number, you must not know him at all.) In Massachusetts, school administrators can retire after 30 years and receive up to 80% of their salary for life. Dad became eligible in 2006. He decided to continue in his job through this summer. It practically cost him money to work. Selfishly, I wanted him to step down three years ago. Running a school system, as you can imagine, requires making agonizing calls from time to time. Disciplinary decisions. Budget decisions. Personnel decisions. My father is a good guy with a good heart. He wasn't meant to lay off teachers or field angry rants from parents. Those kinds of things ate away at him. I happened to be living in his house right after he assumed command. Dad would come home, pour himself a ginger ale and sink into the sofa. He was gone. You couldn't even talk to him. Maybe his insides weren't built for the job, but because Dad was the one most qualified -- how many people have a law degree, a master's and a PhD? -- he had to give it a try. His sense of humor, political savvy and refusal to play favorites ended up carrying him. Still, he lived in constant fear of a salacious scandal, an accident, anything unsavory. Each year that passed without a stumble was a moral victory. ESPN bought my column during the latter part of his career. To his eternal chagrin and infinitesimal delight, my father became a running character in it. His carefully crafted local persona as "the soft-spoken superintendent with long hair and a bushy mustache" started to crumble just a little. He made funny cameos in my NBA draft and Red Sox columns. I joked about his prostate and habit of falling asleep during games. People began to feel as if they knew him. One reader even used "That suit has no buttons" (Dad's take on the Grizzlies' choice of Drew Gooden in the 2002 draft) as his high school yearbook quote. In time, Dad noticed kids staring at him in school hallways. A few even yelped, "The Sports Dad!" For someone who craved anonymity, this wasn't exactly ideal. I didn't care. I couldn't leave him out. I always throw my friends into my columns, and really, he's my best friend, so it would have been dishonest. It was also the right choice. Sometimes I get e-mails from readers who have lost a father; they thank me for helping them remember their dads through my relationship with mine. I am always humbled. Always. Just when he could have bolted, in 2006, his town broke ground on a state-of-the-art high school complex. Dad practically killed himself to get it funded, and he wanted to cut the ribbon as superintendent when it opened. That wasn't up for debate. (This was his second big legacy. The first was the A-Wing, a facility that teaches everyday work skills to special ed students.) So he kept making the same boring 90-minute round-trip drive and praying that nothing crazy would happen. And I kept forwarding him stories about scandals at other schools, hoping to inspire him to flee. "Hey, Dad, you hear about the Idaho eighth-graders who became cannibals?" Nothing worked. I finally gave up. When he turned 60, right after another Wall Street implosion, I worried even more. You don't want to be school superintendent of a middle-class town in a bad economy. The digital revolution brought a second slew of dangers: in-class texting, Internet slam pages, Facebook, digital pictures. The pressures of his job had changed, and not in a good way. He wouldn't even watch Friday Night Lights, explaining simply, "A high school drama isn't exactly a relaxing TV night for me." I was worried about him. Really worried. Like, calling-five-times-a-week worried. Could he survive one more year? It helped when the school was completed this past fall and blew everyone away. When I showed up for the first play in the sparkling new auditorium, Dad squired me around as if he were showing off his new house. He kind of was. Here's the weight room. Here's the gym. Here are the classrooms. I finally understood why he stayed. He had to see this through. These past few months, various clubs and groups have honored him -- I jokingly dubbed it the Kareem Abdul-Jabbar Retirement Tour -- which is funny because nobody is more mortified by that kind of stuff than my father. He didn't even want a retirement dinner. "Just let me sneak out the backdoor on my last Friday," he kept begging. He meant it. We didn't listen to him. The dinner took place last month. There were speeches and gifts, food and drinks, an overwhelming turnout and everything short of a surprise performance from Mr. Holland's symphony. They showed a slide show that broke down Dad's career into three parts: career, family and sports. Everyone was pretty choked up. They even named the new school's lecture hall after him. (He'd never admit it, but I know he was thrilled.) Then he gave a heartfelt speech and everyone drove home. The end. 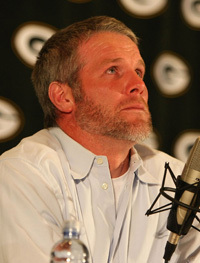 Jonathan Daniel/Getty Images Maybe we'd understand what Favre is going through if we all had to retire at 40. When my father steps down in August, he takes roughly 45,300 unused vacation days with him. Has to be a record. He plans on taking six months off -- his first extended hiatus from work since college -- then he'll consult and do some volunteering. He needs to somehow stuff five rooms' worth of gifts, plaques and framed pictures (and this column, hopefully) into one office of his Boston home. He wants to attend Celtics games, travel with his wife, see his grandkids. It's all good. He made it out alive and left something behind. One of the biggest differences between sports and real life is that when athletes retire, they still have half a lifetime ahead of them. They feel sad because their careers are over, but also because they have no idea what to do next. This is why they come back -- in Favre's case, over and over. When real people retire, ideally, they have accomplished everything they wanted to. My father was lucky in this respect. Like Billy Beane, he put up Moneyball numbers in a middle-class town, essentially winning 95 games a year with a small-market club. He lasted 16 years in a job in which people rarely last five. Of course, we never read tributes about someone like my father for obvious reasons. We pay homage to athletes, entertainers and politicians. Real people don't get victory laps. So here's one for Dr. Bill Simmons. Congratulations, Pops. You made it. To further close the circle: I'm retiring from this space in ESPN The Magazine after seven happy years. Like my father and his superintendency, The Magazine was never an ideal match for me -- I hate advance deadlines and word counts -- and yet, I couldn't be happier with how it all turned out. It's just time for me to try some new things, that's all. And you have to know when it's time. I learned that from my father. Want more of the Sports Guy? Check out the Sports Guy's World.